Directions (1 – 5): Study the following information and answer the questions given below. Eight family members A, B, C, D, E, F, G and H like different colour viz. Red, Blue, Yellow, White, Green, Pink, Violet and Cream but not necessarily in same order. All of them are sitting around a rectangular table. Four persons sits on each middle side of rectangular table, while other four persons on the corner of table. All of them are facing towards the center. Directions (1 – 5): Study the following table and answer the questions given below. The given table shows the total number of candidates appeared, passed and selected in SBI Probationary Officer exam from different regions for the period 2012 to 2017. India become the first-ever team to register 300+ totals 100 times in ODIs, after posting 392/4 against Sri Lanka in Mohali. The new portal will help the Ministry and CPSEs to assess their performance in the procurement process according to the Procurement Policy, 2012. The Finance Ministry, as a result, apprehensions about the negative effects on the software industry are without basis. Directions (1 – 5): The following questions consist of a single sentence with one blank only. 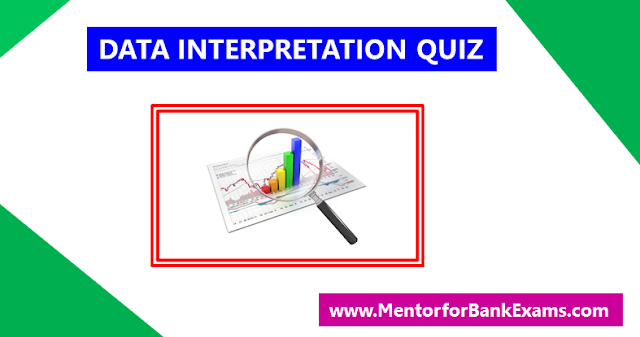 You are given four words as answer choices you have to pick up incorrect pair in option, which will make the sentence meaningfully incomplete or wrong. 1. Mannering’s personal diary, a record of ____ preoccupations and domestic details, belies the depth of thought for which he was renowned in the academic world. Union Health Minister JP Nadda launched new initiatives including Laqshya-A Labour Room Quality Improvement Initiative and safe delivery application at a function in New Delhi on the occasion of Universal Health Coverage Day. The 1st graph shows the percentage efficiency of different boys and the 2nd one shows the number of days taken by different girls to do a certain piece of work. Eight people M, N, O, P, Q, R, S and T live on eight different floors of a building but not necessarily in the same order. The lowermost floor of the building is ground floor and the one above that is number 1 and so on till the topmost floor which is numbered 7. Ground Floor is neither an even numbered nor an odd numbered floor. Each of them likes a different i.e. Purple, Black, Pink, Blue, Green, Yellow, Violet and White but not necessarily in the same order. Directions (1 – 5): In each of the following sentence there are three blank spaces. Below each sentence there are five options and each option consists of three words which can be filled up in the blanks in the sentence to make the sentence grammatically correct. Human Rights Day is observed every year on 10 December – the day the United Nations General Assembly adopted, in 1948, the Universal Declaration of Human Rights. Directions (1 – 5): Sentence given in each question, when properly sequenced, from a coherent paragraph. The first and last sentences are 1 and 6, and the four in between are labelled A, B, C and D. Choose the most logical order of these four sentences for among the four given choices to construct a coherent paragraph from sentences 1 to 6. 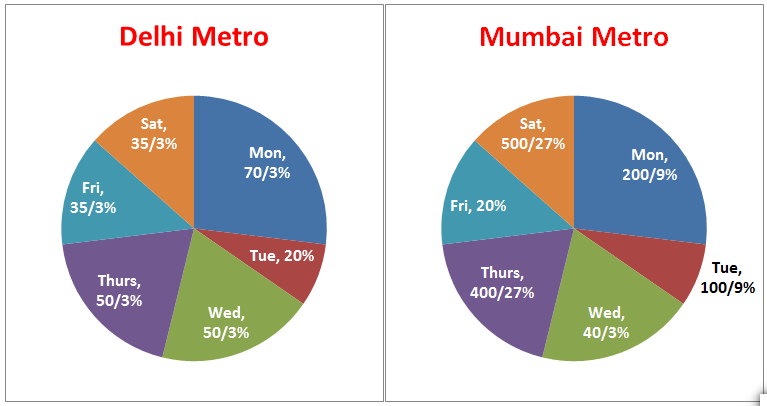 Directions (1 – 5): Given below are the two pie charts which shows the percentage distribution of people who travel a certain distance in Delhi metro and Mumbai metro on six different days of the week starting from Monday to Saturday. Directions (1 – 5): Study the following information and answer the questions given below it. Nine persons i.e. F, A, B, D, X, P, K, G and J live in nine storey building. Ground floor is numbered as 1st floor and top most floor is numbered as 9th floor. They know different languages i.e. Maithili, Tamil, Hindi, German, Urdu, Telugu, French, Bhojpuri and English, but not in same order. Welcome to Mentor for Bank Exams. 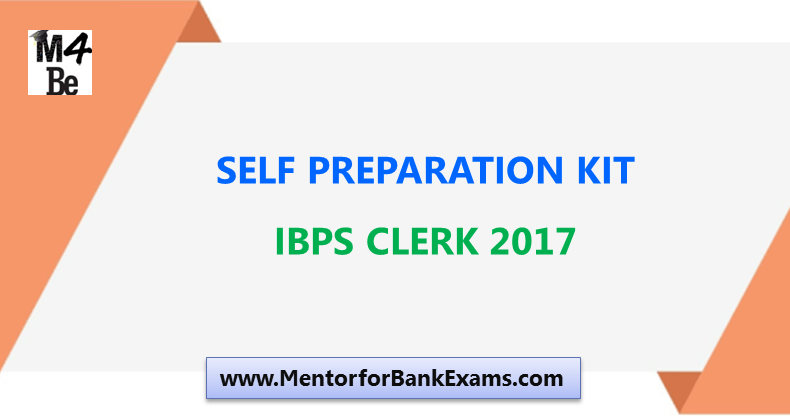 Many of you are preparing for IBPS Clerk 2017. In order to boost your preparation we are introducing Self Preparation Kit covering 35 questions from Quantitative Aptitude Question, 35 questions from Reasoning Ability and 30 questions from English Language in PDF Format. Welcome to Mentor for Bank Exams. 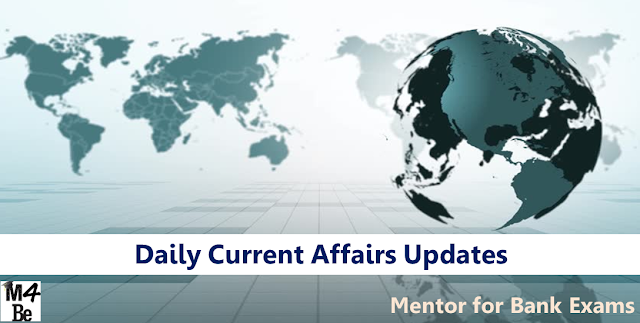 Here we are sharing Weekly Current Affairs 01 December – 07th December 2017. 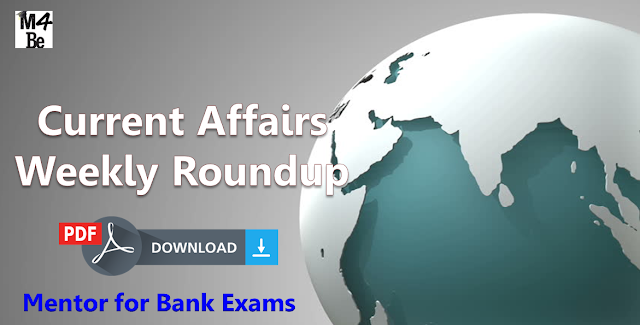 This file of Weekly Current Affairs is a collection of important news and events that occurred in the week 01 December – 07 December 2017. These News are highly important for various competitive exams and interviews. 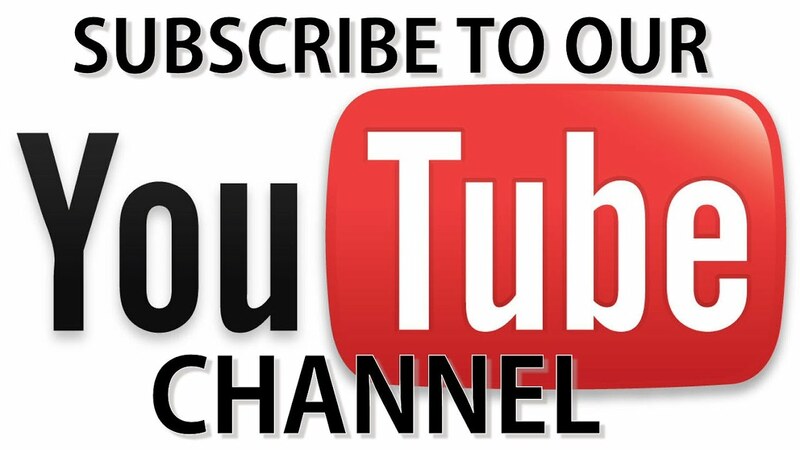 The Forbes Magazine has named former Tesco supermarket worker Dan Middleton as the world's richest YouTuber after he made a fortune of $16.5 million this year. Directions (1 – 15): Each sentence below has a blank followed by four words out of which two words can fit in the blank and make it meaningfully complete. Choose the option which has these two words. If all the words fit in the blank correctly, choose option (E) i.e. All are correct. Eight people - A, B, C, D, E, F, G and H – are sitting around a circular table. A and B are facing towards the centre while the other six people are facing away from the centre. A is sitting second to the right of H. B sits third to the left of the A. D sits second to the right of G. G is immediate neighbour of neither B nor A. E and F are immediate neighbours and are facing outside. 1. P can finish a work in 18 days. Q can finish the same work in 15 days. Q started the work, worked for 10 days and left the job. How many days does P alone need to finish the remaining work? Welcome to Mentor for Bank Exams. As we are aware that Reasoning puzzles are favorite questions in all public examinations. 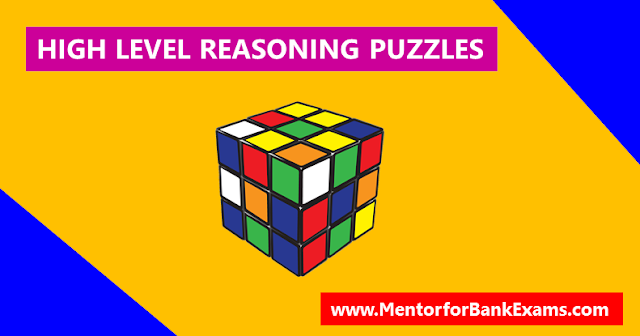 This puzzles questions challenge you to match the correct answers. Some time it’s takes long time to solve questions. Even though we will solve it. But it is recommended to skip the question if you are not able to solve the question with in less than two or max three minutes otherwise you are in trouble which leads to time insufficient. Below are the key points to solve puzzles questions. Directions (1 – 10): In each of the questions given below a sentence is given with one blank. Below each sentence FOUR words are given out of which two can fit the sentence. Five options are given with various combinations of these words. You have to choose the combination with the correct set of words which can fit in the given sentence. Directions (1 – 5): Study the following arrangement carefully and answer the questions given below. 1. Which of the following is the eight to the right of the sixteenth from the right end of the above arrangement? Directions (1 – 5): Study the following table carefully and answer the questions based on it. 1. Who among the following employees earns maximum bonus in comparison to his total income? 2. The income from overtime is what percent of the income from arrears in the case of employee A? 3. How many employees have their salary less than 3 times income from bonus? 4. Who among the following employees has maximum percentage of his salary out of the total income? 5. Who among the following employees has minimum ratio of income from arrears to the income from salary? Directions (6 – 10): Study the following table and answer the questions given below. The following table details the revenue of three major Indian software companies A, B and C and total revenue of all Indian software companies from 2008 to 2012. The 3rd edition of the Dialogue between the NITI Aayog and the Development Research Council of China, the DRC- NITI Aayog Dialogue was held in Beijing. The meeting was co-chaired by Vice Chairman NITI Aayog, Dr. Rajiv Kumar, and Mr Li Wei, President (Minister), DRC. Directions (1 – 5): Read the passage carefully and answer the questions given beside. The oceans are so vast and deep that until fairly recently, it was widely assumed that no matter how much trash and chemicals humans dumped into them, the effects would be negligible. Proponents of dumping in the oceans even had a catchphrase: "The solution to pollution is dilution." Eight persons- A, B, C, D, P, Q, R and S are sitting in a row in which some of them are facing north while some of them are facing south. Only 3 persons sit to the left of R. 3 persons sit between R and Q. B is 2nd to the left of Q. More than 2 people’s sits between B and S, D is 2nd to the left of S. Neighbours of R are facing south. Neighbours of P face the same direction. C is 2nd to the right of A. A and P face opposite directions and similarly B and Q face opposite directions too. 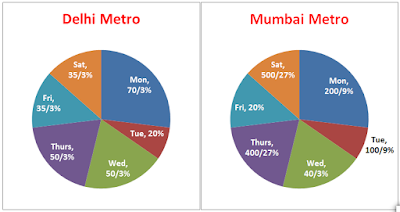 The table shows the number of books sold by 5 different stores on 5 different weekdays. 1. Modi to address India Inc for the first time since GST. Prime Minister Narendra Modi will address a gathering of top industry leaders at the Ficci annual general meeting with India Inc since the launch of GST five months ago. Welcome to Mentor for Bank Exams. As we all aware that Data Interpretation is the important chapter for Banking examinations. 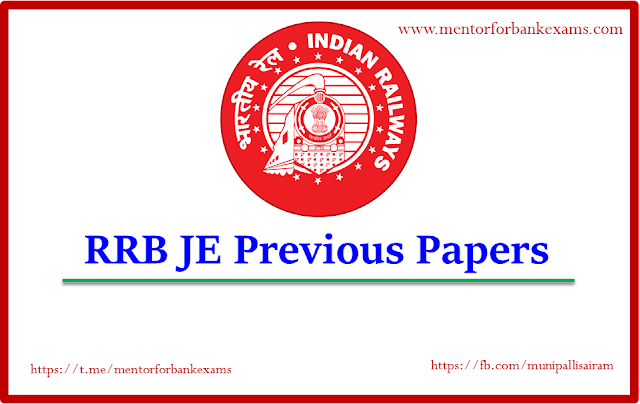 So here we are providing most important Data Interpretation Questions PDF with Answer Key asked in previous examinations like IBPS-PO, IBPS-CLERK 2017, RRB OFFICER, RRB-ASSISTANT, RBI, SBI, LIC etc.. Directions (1 – 5): In each of the questions below, a sentence is given with a blank. Four words are provided below which may or may not fit in the blank to make the sentence grammatically and meaningfully correct. From the given options, choose the one that provides the combination of correct words that fit in the blank. 1. Shared Value Summit 2017 was held in New Delhi. The summit is organised by Shared Value Initiative India, Institute for Competitiveness (India), and SoulAce & India Council on Competitiveness. It aims to provide a platform to identify and address the barriers that exist to equality and empowerment in the Indian society. Directions (1 – 5): In the given questions, assuming the given statements to be true. Find which of the given four conclusions numbered I, II, III and IV is/are definitely true and give your answer accordingly. Directions (1 – 5): What should come in place of question mark (?) in following number series? 1. 2, 3, 6, 15, 45, ? The Union Cabinet has given approval for establishing National Nutrition Mission (NNM) for improving the nutritional status of children (0-6 years), pregnant and lactating mothers. The Mission, under the Ministry of Women and Child Development will monitor various schemes which have been framed for reducing malnutrition. 1. Dia Mirza appointed as UN Environment Goodwill Ambassador for India. Former Miss Asia Pacific, actor, producer, entrepreneur and environmentalist, Dia Mirza, was appointed UN Environment’s Goodwill Ambassador for India. A long-standing supporter of environmental conservation, Dia will take up the role to add more weight to her work on raising awareness of and seeking solutions to the environmental issue.